The new Kettler table tennis table Indoor 10 combines sturdy and reliable technology with the latest ideas and skills of Kettler. Quality Made in Germany. 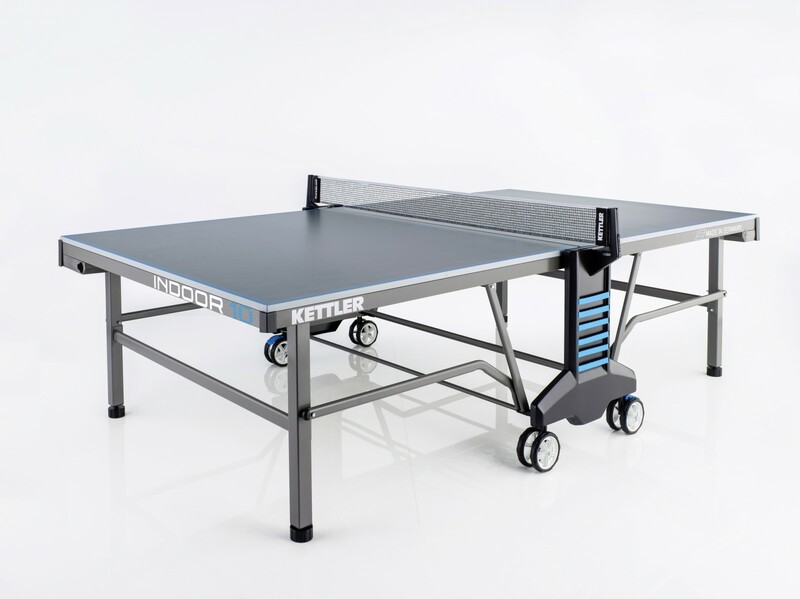 The Kettler table tennis table Indoor 10 is equipped with a sturdy frame made of 50mm square tube and is very stable and low in torsion. The frame connects the 22mm special wood board with the four double wheels. Due to these double wheels, it is possible to transport the table over uneven terrain and move it to your desired place. The innovative ball box for up to 10 balls is integrated in the table halves. 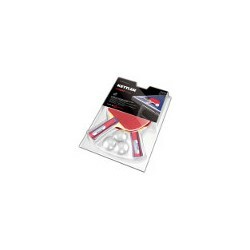 It saves regular searching for balls and the wait between the rallies distinctively. The elastic straps on the net posts are ideal for storing bats, jackets or drinking bottles. The softtouch edge protectors mainly protect the thighs from painful bruises and injuries (when running around). A very safe and comfortable opening and closing of the table halves is possible by the new one-hand locking technology. Die Tischtennisplatte ist meiner Meinung nach wirklich Klasse! Sie scheint sehr robust und hochwertig zu sein. Zudem finde ich die Elastikbänder wirklich Klasse und sehr nützlich. Wir haben alle sehr viel Spaß mit der Platte. Zag door de bomen het bos niet meer. Wilde gewoon een goede indoor tafel. Deze tafel is hier uitermate geschikt voor! Bordet passer godt til hjemmebruk. Bordet er kompakt.Overflaten veier mye,men fargen er pent og behagelig . Bordet er ikke opprettet til skole trening og for hyppig bevegelser frem og tilbake. Et meget solidt bordtennisbord med nem sammenklapning. Det fremstår gedigent og holdbart. Smart funktion i form af boldautomat indarbejdet i bordpladen i begge ender. Bordpladen er solid med en fin finish. Kettler table tennis table Indoor 10 add to comparison list.